LIFE LATELY: Weekend Vibes - Movie, the Black Friday, Food & More. A new kickass series of the blog, which goes by the name of ‘Life Lately’ is going to be about random tidbits from our lives. It may be a day in our lives and from anything usual to the life-changing events or just highlights of current life scenario. Oh and, like always, you all are more than welcome to share your stories and thoughts on ours’ in the feedback section towards the end of the post. Friends and I make sure to take a day off from work and all other engagements and catch up with each other every now and then. Keeps one’s sanity intact, innit? While food, shopping and movies take up most of the time, heavy duty talks (read: catharsis) with no fear to be judged or spontaneous plans of long drives with us humming to the tunes in our kindly-clear-your-throat kind of over-the-top voices and what not! (For reference, see the picture below). Today's post has in store for you a movie review, the best coffee and biryani in town, my experience of/take on the Black Friday sales, and a lot more ALL in one post. So gobble up those nuts with a cup of coffee as you read, and you’ll be my best friend! as I was looking up at the sky (read: roof) here. Since none of us had ever have got the chance to experience the in-stores sale experience; standing in long queues for long and waiting for hours for my turn is something I can never do. I do avail sales sometimes, but only online. Technically, we took the day off and headed to the Centaurus Mall for the Black Friday Sales since there was SO much hype created around it. However, to our disappointment, either the Ready to Wear sales were mostly either on the left out summer stock or selected few items from the winter range. Besides, I feel that although there are so many lawn brands in Pakistan and many new ones are sprouting up, finding a print that is different from the one lying in your closet has become so difficult. I am sick of the funky, digital, graphic, and the humongous floral prints now. Shoe sales were not much impressive either and seeing the long queues, we came down to the conclusion that it would be better not to buy anything at all. Since we were planning on watching Dobara Phir Se ever since its news was doing rounds, we booked the tickets and went for the lunch. It’s funny how not only we evolve as we grow but our choices also change over time. I had never been a foodie until 2012, the year I graduated and the year many things changed, for good. Most of us are not have-proper-breakfast kind of people (except one) unless it is weekend and the unanimous love for biryani being the drive, we headed over to Monal Downtown and ordered Dum Biryani and Russian Salad as the side. 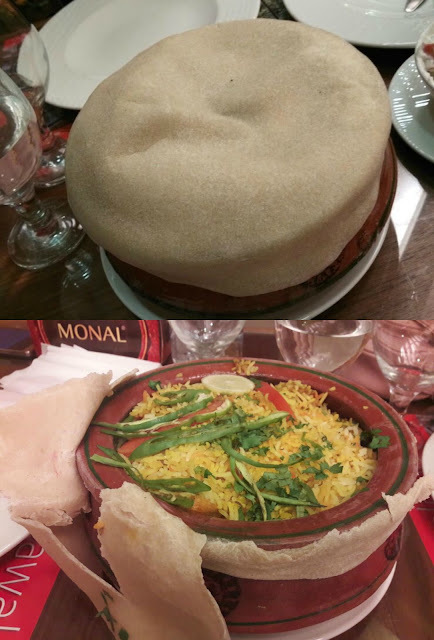 I have been to Monal many times before and have tried most of the items on their menu, from the infamous cheese naans to the platters to the honey wings, different karahis and even their iftaar-dinner, but never got a chance to try their Biryani. Such fun we had while tearing the top layer apart and unravelling the mystery! While the salad was usual ordinary kind (For reference: It is one of the few things that I am really good at making), the biryani (recommended by one of my friends) is simply the best that Islamabad has to offer. Literally, the BEST! 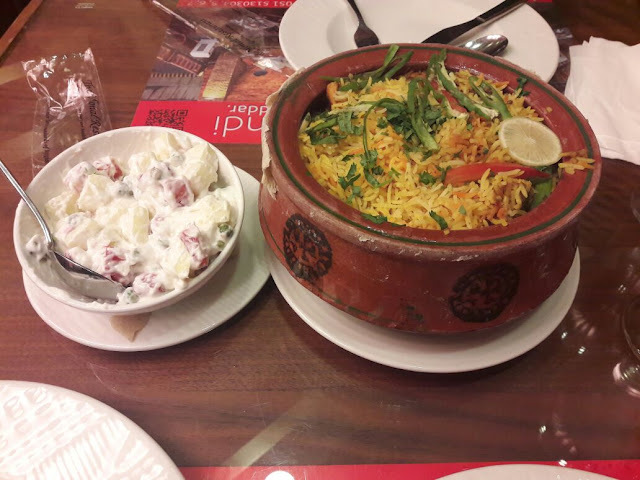 Presented in a mitti ki handi, it not only looked savoury but was simply finger-licking scrumptious kind of.. biryani (the word says it all, you know the feeling, right? ), which is hard to find in Islamabad. Priced at 595 + tax, the serving is enough for two to three people. Bride & Groom: Pictured together. Lulz. Since we have this profound love for Centaurus Cineplex Garlic Mayo Fries, without which we simply cannot imagine watching a movie, we went to the multiplex a bit early. 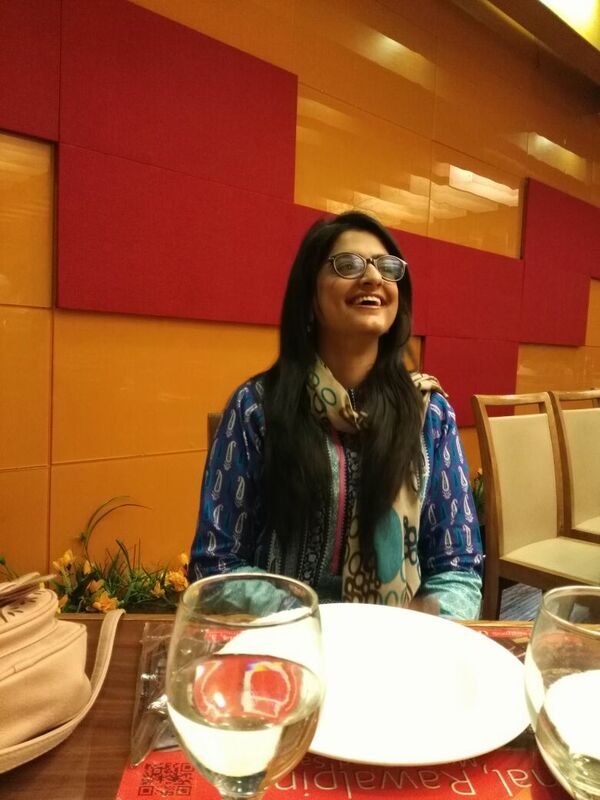 In spite of the fact that the promos did not look much promising plot wise (for reference I’m good with plot anticipations, has to do with my literature background, perhaps), but owing to her previous work, I was still having a certain level of expectation from Mehreen Jabbar. To my disappointment, Dobara Phir Se put them expectations to sham. The movie had such an average, plain boring, and highly predictable sort of a plot with nothing much to offer. 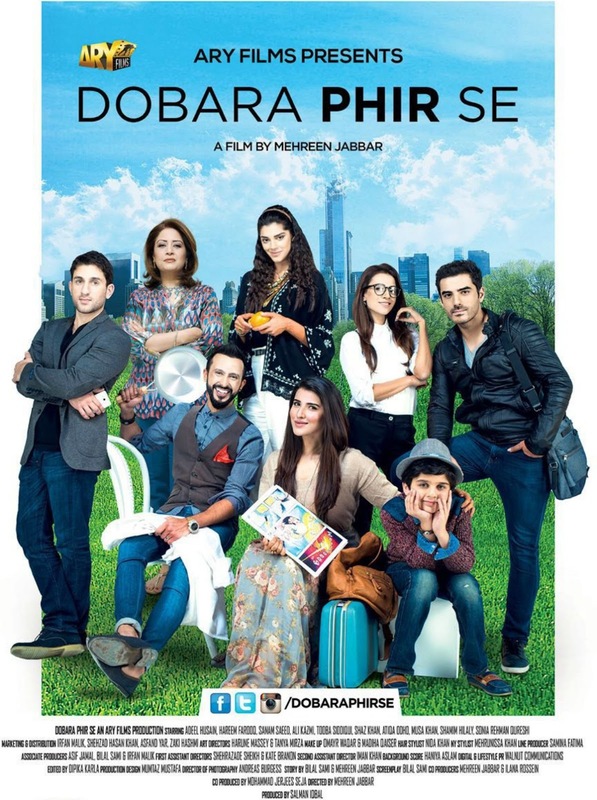 The only saving grace (if there was any.. like 10 percent) was the cinematography, the hotness factor of the lead (male) cast (I’m a big, fat Adeel Hussain fan) and the supporting cast, that is, Ali Kazmi (who, by the way, is my childhood crush and pulled off his character oh-so-well) & Sanam Saeed's natural acting, while the role was quite unlike any she has done before and the very Few one-liners and the A(ww)dorable(ness) of the child star. If there’s one scene that I liked a lot, it was the one where Ali Kazmi proposed Sanam Saeed. His Shahrukh Khan act, which he did so remarkably and effortlessly was indeed hilarious. All in all, it was a very typical, not entertaining in any way (did not even arouse any emotions - no pathos, no laughter - except for 2-3 times, nothing.) take on modern relationships. After giving a slow clap to in our heads, we left the theatre with a headache (thanks to the higher than usual volume of the movie that day), utterly disappointed! While the first half was a little better, the second was more disappointing (read: highly predictable and a bit too dragged). Although the plot did question the norms of our society (where men can "move on" easily and divorced women have to think about their children's future and where people do not understand the fact that if a woman is happy, she can raise her children better) in a good way, without sounding too heavy, the plot has been SO overdone that the thought of talking more about it is making me feel lethargic. Hardly a one time watch, it is. Does not this entice the cravings you've been suppressing for ages? 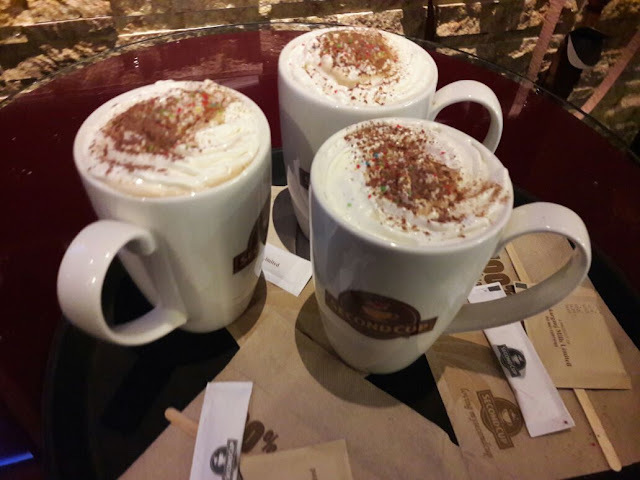 A winter evening cannot end without a cup of coffee so we got ourselves full sized creamy hot coffee variants of Latte, Hazelnut and Vanilla. While their Latte has always been a favourite, I tried the hazelnut one this time, and I absolutely loved it. 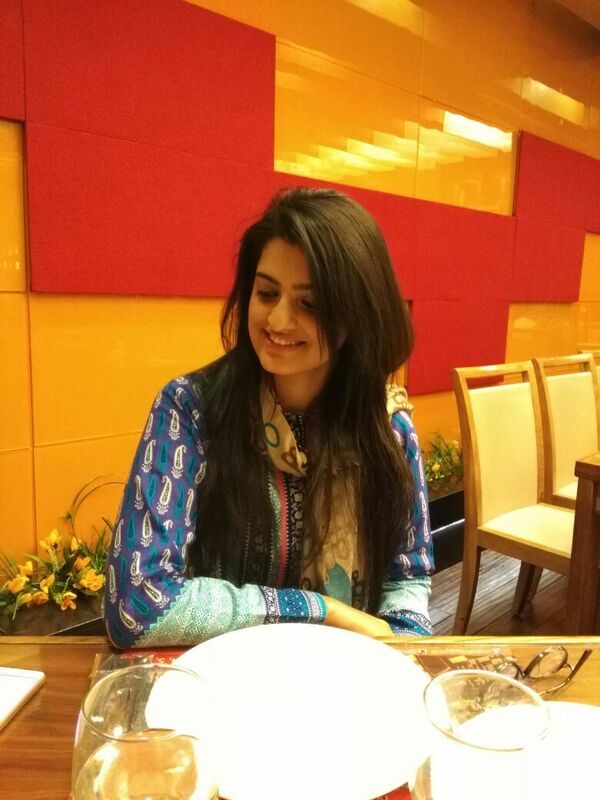 So, acha khaana and a not-so-fulfilling shopping/cinematic experience were the highlights of my weekend! What have you been doing lately? Share your Black Friday hauls or no haul woes, the latest movie you caught up on or just about anything in the comments’ section below.